I have taken the Shinkansen from Tokyo to Kyoto (and back) many times. Always thrilling to catch a glimplse of Mount Fuji's peak. Once, late in the afternoon, the snow was pink. I couldn't move fast enough to take a photo, but it is engraved in my mind's eye. 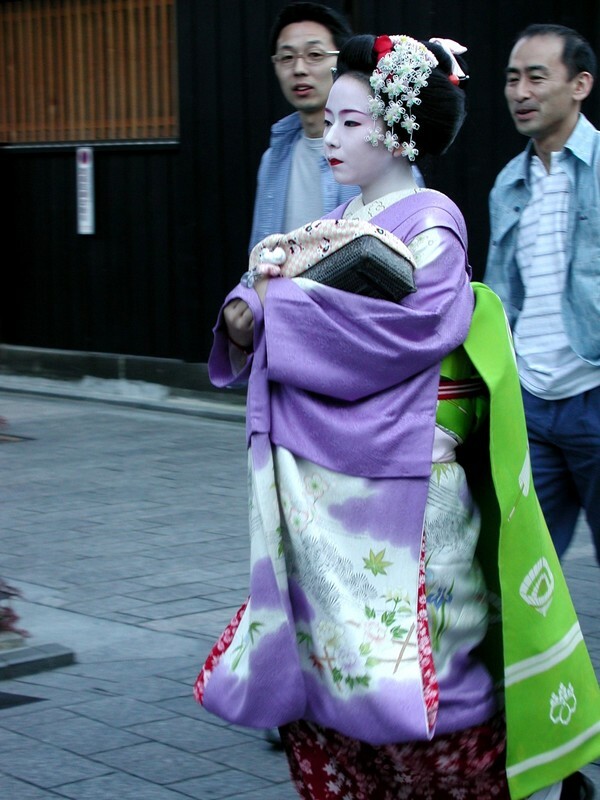 Walking in the Pontocho area in Kyoto one evening, I spotted this Maiko walking to work in a nearby ryotei, traditional Japanese restaurant. Look at the two men oggling her. She was gorgeous. In Koyasan, the center of Shingon Buddhism, I stayed at Eko-in, a Buddhist monastery. It rained heavily one afternoon so I just rested and enjoyed looking at the downpour from the window of my room. One of the joys of traveling in Japan is taking the train. Always a thrill to pick up an obento meal to enjoy on board. These were in Okayama Station. What a great value for about $10. I was fascinated by the sweet countenance of this older gentleman who was blind. He was doing a divination for two young people in the Teramachi arcade near the Oike Dori entrance in central Kyoto. Yet another time I wished I could understand spoken Japanese.